On the brink of World War, a man who becomes a Friend (David Oakes) arrives to his desolate island post on the edge of the Antarctic Circle. Prepared to live in solitude like exile for twelve months as a weather observer, he arrives to find the previous post holder deceased and another inhabitant Gruner (Ray Stevenson) on the island. The seas are angry at mankind who’s tried to ravage her. Guarded with keeping the light for the ships at sea, a yearlong journey awaits as the sea plans to do battle every night with the keepers of the light. As Mexican director Guillermo del Toro gains attention and Oscars for his interspecies aquatic love story, French director Xavier Gens did it first. Arising from the sea of Albert Sánchez Piñol’s 2007 Lovecraft inspired novel in a battle of earth and water, of man and amphibian, of warmth and Cold Skin. The French director who brought us the wide theatrical release of 2007’s Hitman, a video game adaptation to film which rarely goes well, has spent the last decade quietly directing three pretty good independent horror films. In that time he also directed what may have been my favorite segment in The ABCs of Death, the body horror, fat shamming, psychological gore short X is for XXL. Set in pre-World War I era, everything is there to get the period setting right. Gens directs a beautiful film at a picturesque island setting. The small cast is headlined by Ray Stevenson who bares all giving an excellent performance in a variation of a ship’s captain gone mad in solitude at sea. CGI is used better than most studio films with larger budgets. Perhaps it’s the translation from a French director to an English language film or maybe just an American audience expecting what they’re used to but much like Hitman something is amiss. 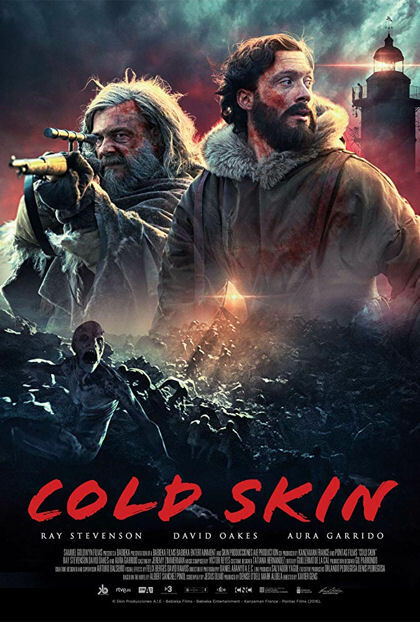 An enjoyable film that hits all the notes, Cold Skin just missed that filmmaking magic that wins Oscars.